Having just seen Gone Baby Gone this evening, I’m at a loss for words. And as a writer, this means a few things. First, it means that you, the reader, will not be subject to my typical hyperbolic prose. Second, it means that I won’t be clicking away at the keyboard all night, which is a plus since I’m supposed to be at work tomorrow. Third, it means that I’m going to have to write something that I never thought possible: Ben Affleck is a good director. There, I said it. He takes what seems, at the onset, to be a simple story of child abduction and creates one of the most gripping films to hit theaters this year. Casey Affleck proves his mettle as leading man material in the role of Patrick Kenzie, a Boston detective who is constantly trying to decipher the difference between right and wrong. Faced with one moral dilemma after another, the film begs the question again and again: what would you do in this situation? I’m being vague here, obviously, because explaining any of the other characters and situation robs the film of one of its greatest assets: the element of surprise. I will say that Morgan Freeman and Ed Harris are phenomenal, with each of their characters emphasizing the moral ambiguity of the film’s plot as two characters who are trying to do the right thing but…well, you’ll see. The ending hits you like a shotgun blast and leaves you reeling for hours afterward. One of the major things I took away from this film, and I’m not sure if other viewers would agree with me on this, was how Affleck characterized the city of Boston. Affleck’s Boston is gritty, often unattractive and populated by flawed, unappealing people. But there’s a warmth there, evocative of an artist coming to terms with his hometown and bringing to light his own roots in the most raw fashion possible. It's similar to Martin Scorsese’s relationship with New York in his own films. There’s love intermingled with disgust and a tinge of sympathetic admiration. 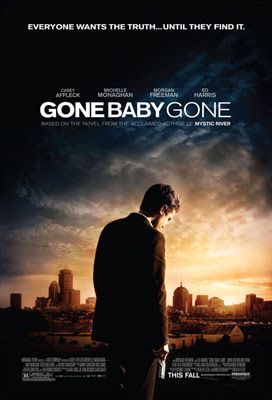 Gone Baby Gone might be one of 2007’s best films and one of its most pleasant, albeit bittersweet, surprises. I love how you described his portrayal of Boston. It was exactly how I would shoot buffalo, without the accents. The people are scary but you love to hate it all the same. I also liked how you were at such a loss for words but you still found 366 of them to fill this excellent blog. HAHA!